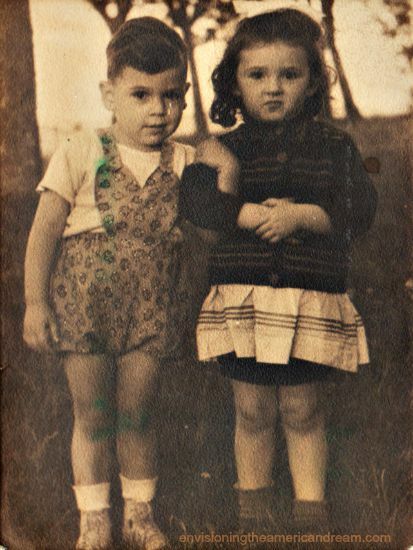 I married a refugee who as a little boy was perceived as a threat to Cold War America and not as a survivor of the Holocaust. 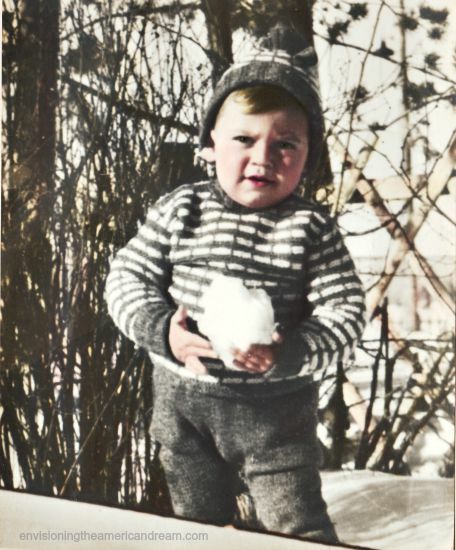 While my childhood was a sugar frosted world of frost-free fun living out the post war suburban dream, my husband would spend the first four years of his life in a displaced persons camp, while Congress bickered unwilling to change existing restrictive immigration laws that severely limited the number of Eastern European allowed. Was he any more of a threat to our country than a Migrant Central American or Syrian refugee child is today? Steeped in fear, some Americans have a habit of marking an entire people as predisposed to disloyalty. Tragically one sits in the oval office today, wielding a mighty presidential pen issuing out executive orders grossly affecting the lives of millions and tarnishing America’s moral authority. His presidential policy is to appeal to his base with racially motivated attacks on immigrants. 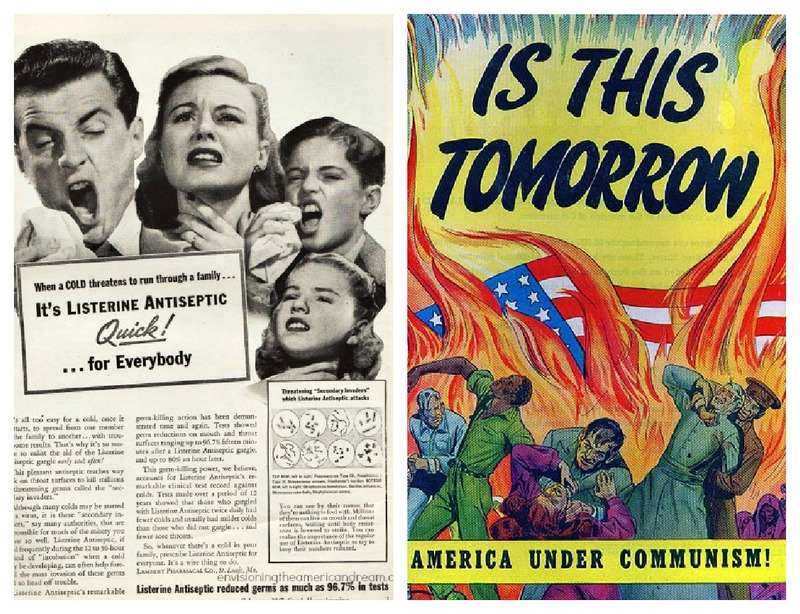 When it comes to American paranoia, Donald Trump’s fear based, fear driven policy aimed at the other feels eerily familiar. Fear mongering media and xenophobic politicians cry out in protest at the possible influx of refugees seeking a safe haven. Squawking like Chicken Little, they ominously warn of the dire consequences and threat to America if we allow “these tired, these poor, these huddled masses” of refugees ‘yearning to breathe free” into our homeland. Now that certainly sounds like a diagnosis from the good doctor, Ben Carson. 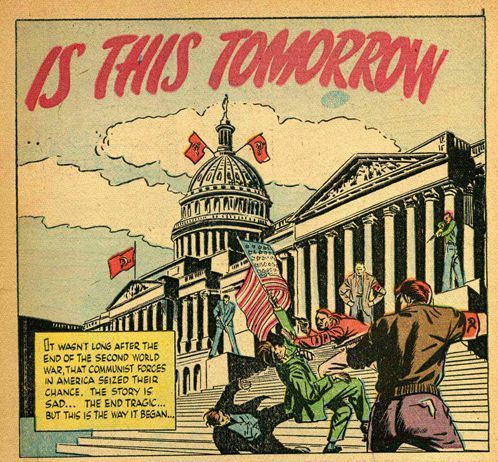 “Is this Tomorrow?” A panel from the 1947 anti communist comic book designed to teach people about the subversive nature of communism. Only the speaker here was not directing his paranoia at the fear of a Muslim terrorist sneaking into the U.S. along with the Syrian refugees or a dangerous MS-13 gang member from fraudulently sneaking in by applying for asylum. These remarks were uttered over 65 years ago about another group of refugees seeking asylum, East European refugees. This fear mongering claiming national security that sounds straight out of the Trump racist playbook on Central American refugees, is actually a page from the cold war anti-communist rhetoric directed at the displaced persons of WWII. 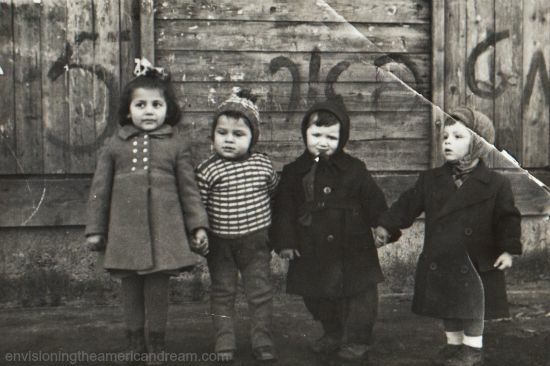 The current policy of blocking refugees fleeing a violent homeland desperate to seek a safe haven, mirrors the deep freeze experienced by displaced placed Eastern European Jews during the cold war whose efforts to get to a safe haven were met by a cold shoulder. 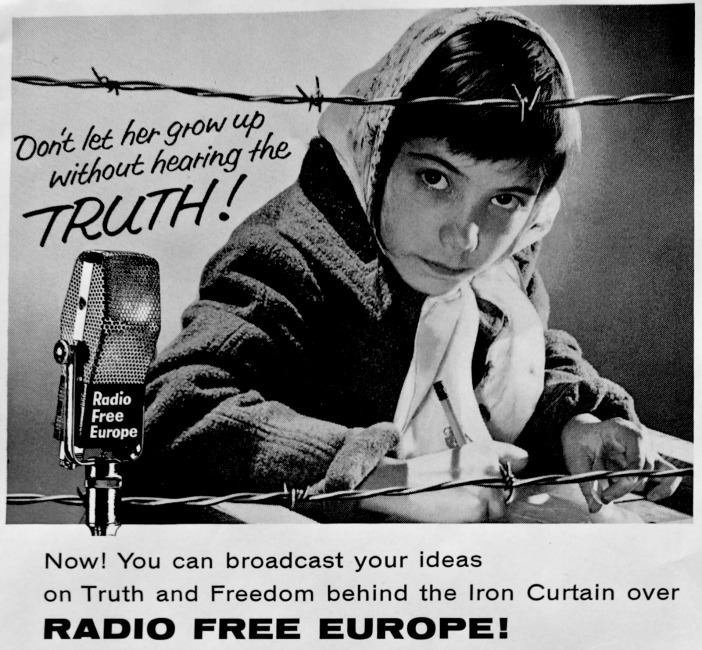 The cold war cast a particularly chilly response to the desperate plight of the displaced person of Europe due to our heightened fear of Communist infiltration. Thanks to the peddling of irrational fears to a panicked and paranoid public, many post war Americans were resistant to the idea of welcoming these poor souls to our shores. Displaced Persons in a DP Camp, Germany 1947The conventional wisdom that we immediately opened our shores with outstretched arms to these displaced persons has become a more romanticized version of the truth; the harsh edges of their struggle to enter the land of the free have softened over the past 70 years. 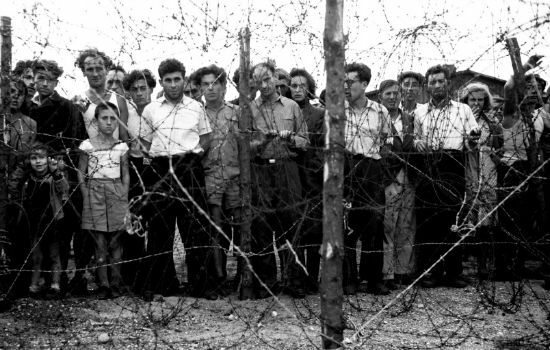 Liberated Jews suffering from illness and exhaustion emerged from concentration camps and hiding places to discover a world which had no place for them. Well into the post war years, thousands of European Jews remained locked in displaced persons camps in Germany and Austria. Without a home, many were afraid to be repatriated because their countries were now police states under Soviet occupation. For these ¼ million stateless, homeless Jewish survivors, prospects for resettlement in free democratic lands appeared uncertain. These huddled masses yearning to be free had nowhere to go. It is a story that hits close to home. 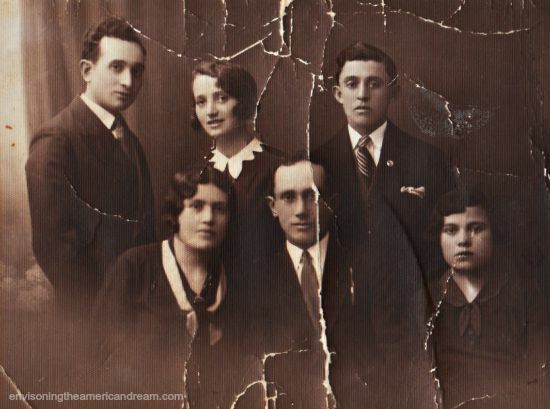 My future in-laws were Holocaust survivors. Strong national prejudices, procrastination in Congress and some less than dynamic leadership in White House combined to prolong the miseries of Jews who survived the Holocaust. All over Europe after the war ended in May of 1945, like a great backwash to the tidal wave of war, almost 10,000,000 confused, depleted and hungry human beings were wandering from place to place amidst the rubble of war. Some were newly liberated labor slaves, some concentration camp survivors, some civilians, some prisoners of war. Trudging on foot, hitching rides on bicycles, looted German cars, trucks, and hay wagons this stumbling mass of humanity moved steadily on urged on the idea to get home. For many there was no longer a home. Many survivors who went home faced hostility from their neighbors and found their homes, possessions and jobs gone. Braving the incertitude among history’s most jumbled mass of migration was a courageous young Jewish woman grown older than her 23 years through the unspeakable horrors that no one should ever bear witness to. Her entire family lost at the hands of the Nazis, separated from her husband, she trudged on with her meager belongings tightly clutching her most valued possession, her precious newborn baby. This tiny baby boy, born without a home, who would never know what it was to grow up with grandparents, uncles or aunts would one day grow up to be my future all-American husband. 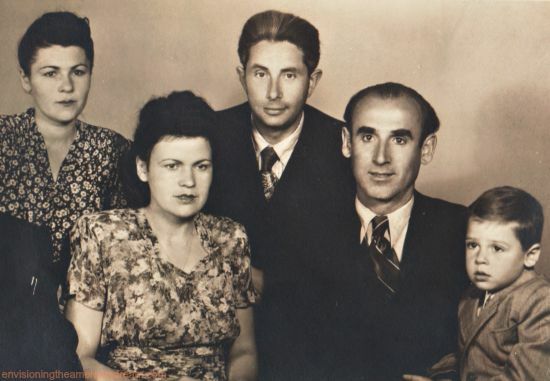 Unable to return to her now vanished hometown in Poland, reunited with her husband, they found their way to a displaced persons camp in Germany. Before the end of 1945, more than 6 million of those uprooted by the war found a home leaving 1.5 to 2 million displaced persons. Most Jewish survivors were unable or unwilling to return home because of persistent anti-Semitism and the destruction of their communities during the Holocaust. Many of those who did return feared for their lives. In postwar Poland, for example, there were a number of violent riots that claimed scores of Jewish lives. The big question was where to put the people who could not be repatriated? 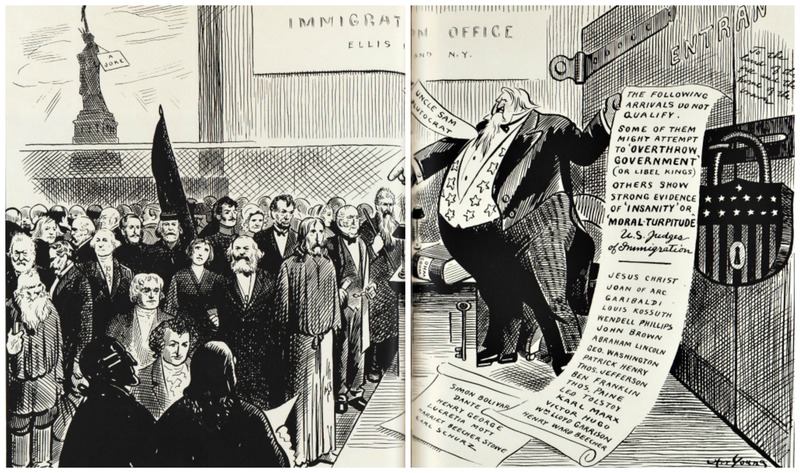 “You’re a Cheap Bunch of Soreheads and You Can’t Land Here,” says a bloated Uncle Sam in cartoonist Art Young’s protest against discriminatory immigration laws. This editorial cartoon appeared in “The Masses” the radical, socialist magazine that attacked the status quo. Restrictive immigration policies were still in effects in the U.S. and legislation to expedite the admission of Jewish DPs was slow. These constricting immigration policies had at least a partial basis in anti-Semitism and racist theories, thanks to immigration laws passed between 1882 and 1929 that were among the most discriminatory in the world, regulating immigration by race. Despite loosening of some quota restrictions, by the end of the year opportunities for legal immigration to the United States remained extremely limited. Congressional action was needed before existing immigration quotas could be increased, so while Congress procrastinated and bickered, my husband would spend the first four of his life in a DP camp looking for a country that would accept him. These Jews did not receive the welcome promised in the poem by Emma Lazarus inscribed on the Statue of Liberty “I lift my lamp beside the Golden door.” In the years following the end of the war, the lamp was dimmed, the door too often closed. Cast in a cold war light, these refugees became even less desirable. Part of that opposition was fueled, as it is now, by stereotypes of the refugees as harbingers of a dangerous ideology, in this case Communism. By the beginning of 1947, the composition of the DP camps had changed. The camps were very overcrowded due to the daily influx of Jews from Eastern Europe fleeing oppressive Soviet occupation. 250,000 Eastern European Jews including large numbers of families and children from Czechoslovakia, Hungary, Romania, Poland, and Soviet Union joined the other displaced persons of the Holocaust. As my husband and his family lingered in an overcrowded DP camp waiting for a country that would accept them, politicians and a fear mongering media debated the loyalty of Eastern Europeans and the fear of communist infiltration. 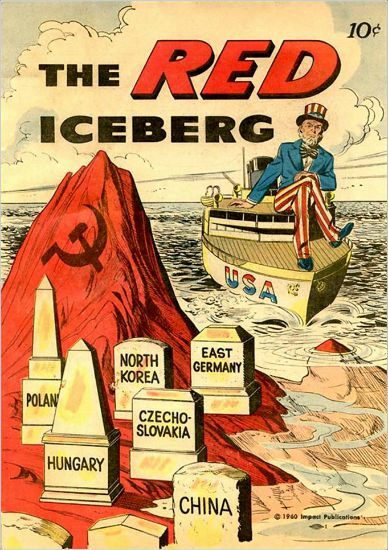 By 1947 relations between the Soviet Union and U.S. were in the deep freeze; the cold war was frozen solid. In the black and white cold war world war of good vs evil, America was certain that the communists were waging an aggressive campaign of hatred against us embarking upon an aggressive campaign to destroy free government and the American Way of life. Uncle Sam was convinced that Russia was hell-bent on destroying the traditional American way of Life and had their cunning communist eyes set on infiltrating America with whatever means they could. American feared being infected with a good case of communism. 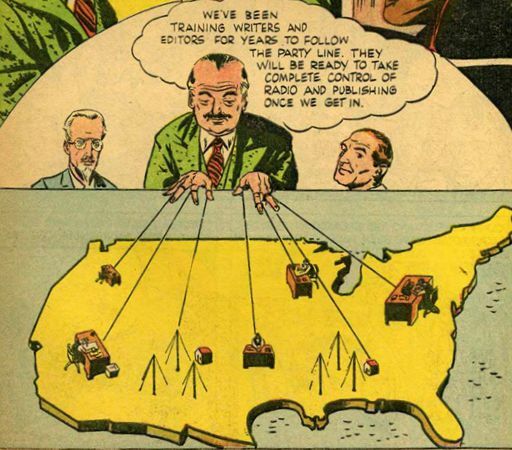 (R) Is This Tomorrow a 1947 comic book designed to teach people about the subversive nature of communist infiltration. The very health of democracy was at stake, unless these morally corrupting influences were wiped out and banned from our shores. More frightening than polio was the spread of that ideological virus communism. And the displaced persons camps were prime breeding grounds for this subversive cunning germ. It was a virulent strain of ideology that once exposed, there was no cure. We needed to quarantine the public from the spread of this dangerous virus. Many were convinced Communists had infiltrated the DP camps, posing as refugees in order to enter the country where they would soon overthrow the government. People testified in Congress that the Soviets had placed “trained terrorists’ ( trained at terrorists institutions in Moscow) in the DP camps . As a reflection of their “natural tendencies” the perceived politics of the displaced person’s thus posed a threat to American nation. What it boiled down to was loyalty and trust calling in to question the loyalty of immigrants from Eastern Europe. Marking an entire people as pre disposed to disloyalty is a familiar refrain. Opponents of DP immigration often spoke of how the DPs and the “ideological germs” that they carried would weaken the nation from within, echoing fears of “race suicide” that had been so prevalent in debates about immigration earlier in the century. However as time went on President Harry Truman stood up against the public opinion and Congress in his battle to open the door of the U.S. to Jewish DPs. He urged Congress to enact legislation that would admit thousands of homeless and suffering refugees of all faiths to the U.S.
After pressure, Congress passed the less than magnanimous 1948 Displaced Person Act ( an act to authorize for a limited time the admission into the U.S. 200,00 of certain European displaced persons) which was highly selective using date restrictions designed to limit the number of Jewish refugees eligible for entry. As more refuges were being admitted, a cold war re-branding of the DPs began to take hold. 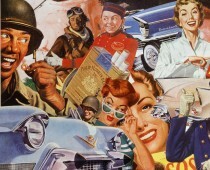 In the war against communism they could use their plight to our advantage. The obvious fact that the DP’s who might technically be able to return to their East European homelands refused to do so because of feared Communist rule, had somehow previously eluded them. Many folks began to realize that far from destroying the nation from within, the politics of the DPs especially their anti-communist feelings could strengthen the nation in its conflict with the Soviet Union. For many of the proponents of DP immigration, the DPs did not represent the communist contagion but rather the anti-communism inoculation. They would be living proof of the terrors and horrors of Communist rule. In its final report the USDPC urged the resettlement of refugees from communist tyranny should become part of Cold War U.S. Strategy. These displaced persons served to remind us of the dangers of totalitarian communism! 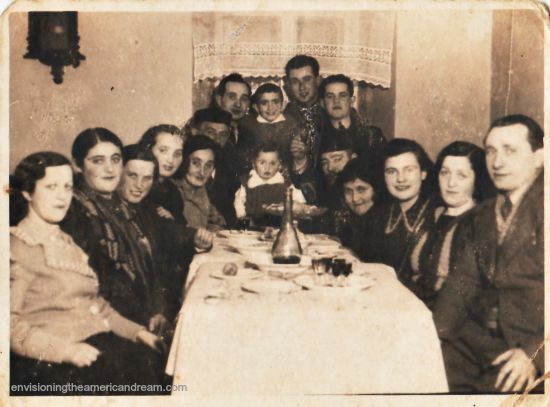 In the fall of 1949 a few months before a relatively unknown senator from Wisconsin began his 4 year witch hunt for Communists, my future husband and what remained of his family arrived in the states from their DP camp in Germany. After a ten-day crossing from Bremerhaven, Germany, the ship steamed into NY Harbor. On board were other displaced persons some were survivors of concentration camps others refugees from Russian persecution. Some were so old that they had little to look forward to except burial at last in American earth; others like my husband, so young that soon they would have no recollection at all of Europe. But all of them felt grateful to the country that had finally given them a safe haven. Only 4 years old, Hersh who had spent almost all his life behind barbed wire was able to adjust quickly, learning phrases that would take his parents months to learn. His first experience here was watching Hop Along Cassidy on TV. This little 4 year boy who could only speak Yiddish donned a cowboy hat and learned the language watching good old American westerns. As his parents watched him change from a displaced person with a number into an American, they beamed with happiness. Today this former unwanted refugee is an attorney defending those most in need of help, whose eloquence owed a lot to those 1950s cowboy and the generosity of America for welcoming him. 1. Note: So much criticism was heaped on the 1948 Act that Congress later passed amendments extending allotment of US immigration visas for DPs to approximately 500,000. The 1950 revision succeeded including treating all European refugees “equally as members of the human race” as the NY Times said in an editorial at the time. Is Donald Trump human? I don’t honestly know anymore. His decisions are senseless starting at the most basic level. He has five children, and nine grandchildren. What if they were locked behind those gates as babies, screaming for him? Would he feel anything? He has German ancestry from his father’s side. Can he not imagine his family on the wrong side of Nazi Germany, hiding in fear, desperate to escape? He was born in 1946. If his family had not left Germany much earlier, he could have been one of those babies born to a displaced person, like your husband was. His own mother might have been in your mother-in-law’s shoes, seen as a threat and burden to a prosperous country rather than what she was – a scared young woman with a baby in need of help and safety. I guess when you have money and power, human beings cease to matter. What a horrible, horrible shame for us all. Trumps lack of empathy, compassion and sheer human decency is appalling and can only point to a morally bankrupt human.So many, many are suffering because of that.That said, our country does have a sad and often tarnished record of not always warmly accepting of the perceived “other” based on fear. Thank you Heshie for sending me this excellent, thoughtful piece. I’ve known your Hersh for many years. Juxtaposition of his life’s work with tRump’s hatred highlights the need for people to make the right choice and stand up for Human Rights. All that needs to happen for the evil in this world to dominate right minded people is for those who see what you have written of to ignore its existence, or despair of being able to combat it. Thanks Mark for your thoughtful remarks.